The HDI mini-consortium was created in 2011 as a mechanism for CPES and industry members to address emerging or long-term challenges in power electronic integration. While it is supported primarily by CPES membership, it also leverages sponsored research with major industry partners. The tradeoffs among reliability, efficiency, cost, electromagnetic compatibility, power density, and speed are explored as new new materials, components, circuits, and applications emerge. The commercialization of wide bandgap semiconductor devices, such as silicon carbide and gallium nitride, as shifted switching frequency beyond tens of megahertz, power rating beyond megawatts, and junction temperature beyond 250° C. Ancillaries, characterization metrology, modeling methods, packaging processes, and manufacturing paradigms need to be transformed. Unique high-temperature packaging technology is an example of CPES' fulfillment of these critical needs for the future power electronics industry. The HDI mini-consortium has developed die-attach materials which can be processed at low temperatures, yet are reliable at the temperature of the wide bandgap junction. Processes have been developed to encapsulate ultra-thin planar packages with polymer having high glass transition temperature and dialectric strength. Magnetic materials with low core loss density have been synthesized from magnetic metals for additive manufacturing of high-frequency magnetic components. Inductors have been integrated into the converter package as a substrate to achieve power density approaching 1 kW/in3. Over-molding magnetic materials have been synthesized for integrating energy storage and protection functions. Techniques to decouple the noise loops have been identified to enable high dV/dt commutation in wide bandgap switches. Design methodologies have been documented for high-temperature capacitor power buses, protection, sensing, digital control, etc. New breeds of gate drivers, sensors, active filters, and passive filters have been demonstrated in a wide range of products, from power adapters to power-electronic building blocks. Significant improvement in power density, efficiency, and signal integrity are expected thanks to the adoption of the technological advances. 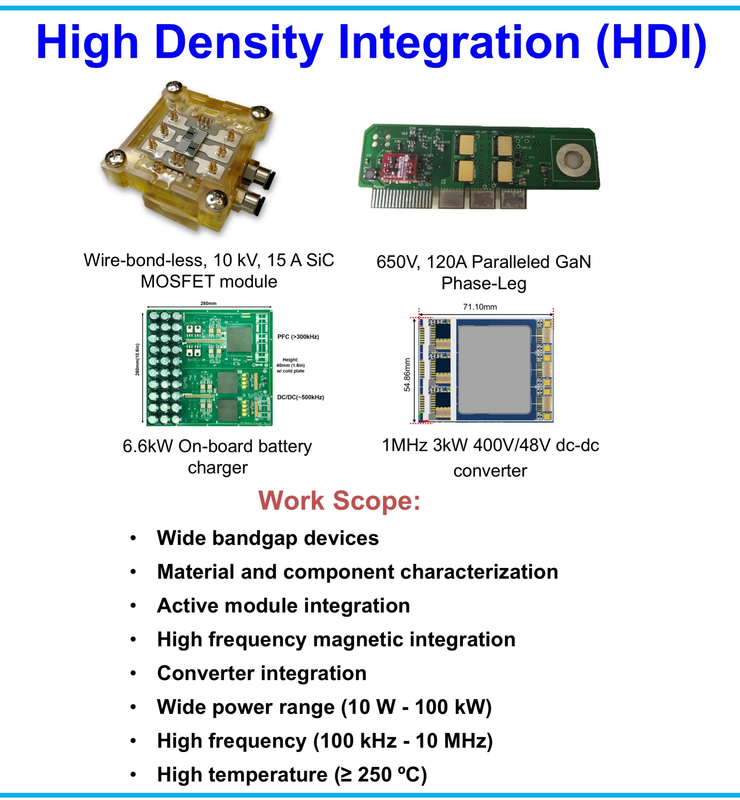 HDI tasks are scoped to advance wide bandgap systems, magnetic components, and module integration.